A man gestures while describing a motion event. The fact that he is looking at his gesture suggests it is a "foreground gesture" central to his utterance. Read the article here. An "analogical gesture" representing the trade-off between interest rates and inflation rates. Read the article here. 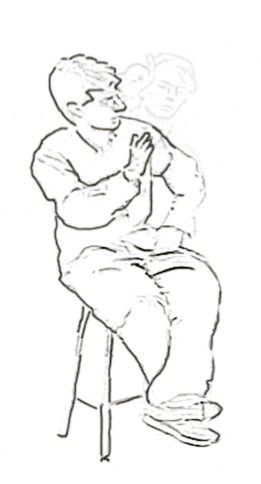 A schematic depiction of a gesture used to represent a positive feedback system. See the study here. A speaker directs claw hands toward her body to characterize the feeling of being "sick." Read the study here. How the face changes from rest (left) when producing the 'S-action' involved in Yupno nose-pointing (right). Read the study here. A participant in the Yupno valley is screened for understanding of number terms before completing a number line task. Read the study here. A participant gestures as he recounts the history of the universe. English speakers produce a handful of recurring gesture types when referring to time. Read the study here. A detail from Leonardo’s The Last Supper, showing three apostles producing gestures with the palms turned up. Palm-ups like these are ubiquitous in gesture and sign around the world, but their meanings and origins remain a puzzle. Read the article here. A schematic depicting the set-up of the 'Stacks and Squares' task, used to elicit pointing gestures and demonstratives across cultures. Read the article here. A Yupno participant arranges cards representing different numerosities. See the study here. 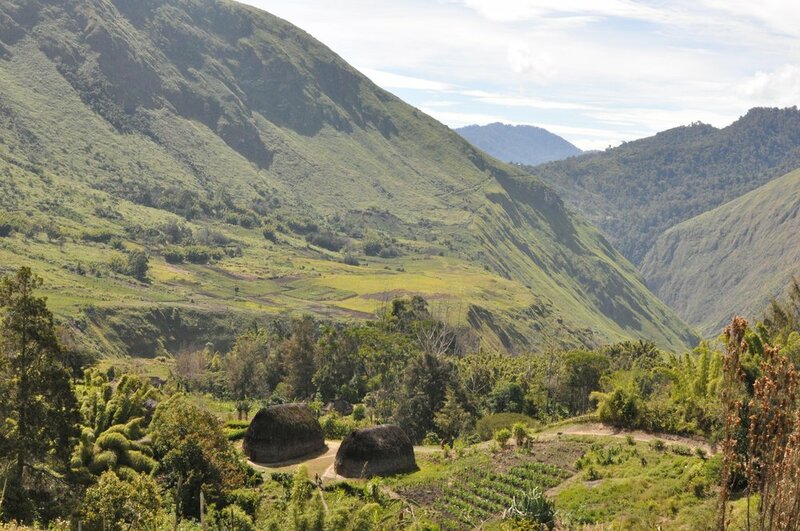 Two traditional houses face upvalley in the Yupno valley of Papua New Guinea. Yupno speakers use an uphill-downhill reference system both outside and indoors. See the study here. A schematic depiction of a referential communication task used to elicit demonstrative reference and pointing gestures. The task involves identifying novel creatures. See the study here. Examples of time-related gestures that simultaneously embody both left-right and front-back models of past, present, and future: the speaker locates the past both leftward and backward (left), and the future both rightward and forward (right). Read the study here. When referring to the past ("yesterday"), Yupno speakers directed their gestures downhill, toward the mouth of the Yupno river; when referring to the future ("tomorrow"), they directed their gestures uphill, toward the river's source. Read the study here.